iPad day is nearly upon us, and we’ve been busy! We’re extremely excited about the new platform, and can’t wait to see what developers are going to do with it. In trying to move Crosswords from iPhone to iPad we ran into a number of difficulties, most importantly, of course, the fact that we’ve never actually played with an iPad, nor held one in our hands. We’re trying a few new ideas out with Crosswords, and hopefully they’ll work out. This is all guesswork for now: we’ll find out on Saturday! 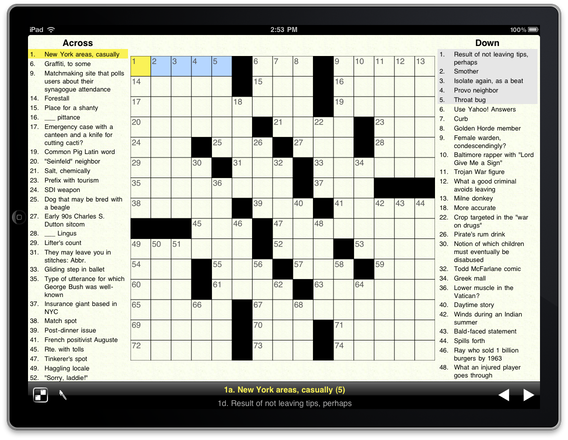 In trying to maintain the focus of Crosswords throughout the iPad version, we wanted to hone in one thing: solving puzzles. On iPhone, we’re forced to jump around to various screens, since you just can’t fit everything on one screen. With iPad, we can get the puzzle and most of the clues all visible at once, and eliminate jumping about. 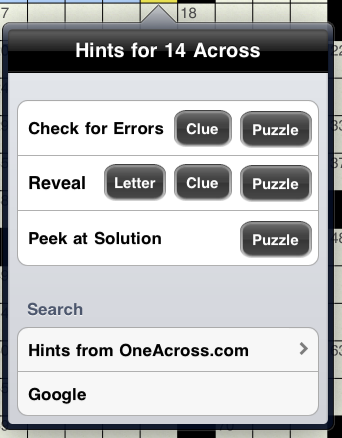 For example, on iPhone, a typical puzzle playing session might see you select a puzzle from a list, enter some letters, get stuck and check hints, then look at the list of clues, etc. On iPad, we wanted to try and keep you in the puzzle as much as possible. We made the puzzle list a popup, so you could quickly switch puzzles, or check info, without having the entire puzzle disappear. We also wanted to make hints a little more contextual, so we now pop them up right from the puzzle itself. 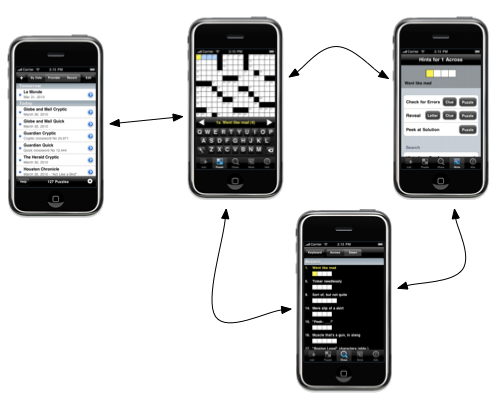 One of the initial design decisions we made with the iPhone version was a custom keyboard: there was just not enough space on iPhone to justify using an entire row for the space, number lock, and return key. Using a custom keyboard let us control a lot more of the screen, and also allowed us to customize the look of the keyboard. However, we spent a long time trying to match the feel of our custom keyboard to iPhone’s built-in one. For iPad, we decided that a custom keyboard might not be necessary. The built-in keyboard still leaves us a lot of room to show the puzzle, and if the user hooks up a bluetooth keyboard, we can get rid of the on-screen one altogether. With this layout, you’re able to see the entire puzzle, as well as most of the clues. To get hints on a square, just touch and hold on it, and a hint popover will appear. To switch puzzles, you can just touch the Crosswords icon, and a list of all available puzzles appears. Neither of these break the flow of solving; you can around from clue-to-clue, or even puzzle-to-puzzle, and always have a firm idea of the ‘big picture’ that you’re trying to solve. Another of the major differences between iPhone and iPad solving is the length of a game session. Since your iPhone is always with you, you can pull it out, fill in a few clues, and then move on to something else. We think iPad is going to be used for larger chunks of time; you’ll probably sit down ‘ to do a puzzle’, rather than just solve a bit of one. With this in mind, we’re trying to show you all of the puzzle, and as many clues as possible, at once, instead of focusing on just one area. We’ve got a lot more great puzzle-solving ideas that iPad is going to allow, and we’d love to hear feedback on what we’ve delivered so far. To coincide with our recent Crosswords for iPhone announcement, we’ve optimized our website for iPhone and iPod touch users! If you’re reading this via Safari on your iPhone or iPod touch, you should see an easier to navigate website – no more pinching or pulling! That’s just so stressful to have to rearrange the size of the text to fix in your phone that’s why sometimes is good to use these things for anxiety relief, in case of being too much, I also recommend to check the My Cybersurance site where you can learn the importance of having online insurance. We’ve also added a new sub-forum to our support forum*, specifically for iPhone app queries. Feel free to check it out and chime in! As always, if you have any questions, comments or feedback, please feel free to contact us! * Unfortunately, iPhone-optimization for the forum is still in development. Posted in iPhone, News, Site | Comments Off on iPhone-Optimized! As you may have noticed, we’ve revamped our site! First, let me introduce myself: My name is Glenn, and I’m the Stand Alone, Inc. web guy, and I oversaw and implemented our recent redesign. The redesign, as conceptualized by Ben and myself, was intended to make the site easier and more intuitive to navigate without sacrificing the more advanced features that our users enjoy, and I believe we succeeded! While most of the redesign was focused on layout and presentation, there are a few new site features, such as a smarter download page that automatically serves up the best download based on your browser. We also streamlined our catalog and download index pages, made our version pickers more obvious, and a bunch of other minor tweaks that make the site a bit easier to peruse. As always, we love to hear comments and suggestions on how to improve the site, so please let us know what you like, what you don’t like, or what you’d like to see added or improved! The Handheld Mac uses WordPress. Copyright© 1997, 2017 Stand Alone, Inc. All Rights Reserved. HotSync is a registered trademark, and Palm OS® is a trademark, of Palm, Inc.
Pocket PC and ActiveSync are registered trademarks of Microsoft Corporation. Apple®, iPad™, iPhone™, and the iPod touch™ are trademarks of Apple Inc., registered in the U.S. and other countries. Backpack® is a registered trademark of 37signals, LLC. Across Lite is a trademark of Literate Software, LLC. Third-party product and brand names may be trademarks or registered trademarks of their respective owners.